Criminal Appeal No. 870 of 2007. D/d. 21.5.2012. (hereinafter referred as 'Indian Penal Code') and imposing the punishment to suffer rigorous imprisonment for life and to pay a fine of Rs. 500/- in default to further undergo one month simple imprisonment. A. Buta Singh (PW.15) lodged an oral report on 4.5.2001 at 1.00 a.m. at P.S. Hanumangarh, District Hanumangarh stating that on intervening night between 3/4.5.2001 at about 12.15 a.m., Jaswant Singh (PW.1) received a telephone call from Dr. Amarjeet Singh Chawla (PW.4) to the effect that Jaswant Singh's daughter was perturbed and, therefore, he must immediately reach the house of his son-in-law Kaku Singh. Buta Singh (PW.15), informant, also proceeded towards the house of Kaku Singh deceased, alongwith his son Gurmail Singh. They met Jaswant Singh (PW.1) and Geeta (PW.16), his daughter in the lane. The main door of the house was closed but the window of the door was open. They went inside through the window and found two cots lying on some distance where fresh blood was lying covered with sand. They also found the dead body of Kaku Singh in the pool of blood covered by a quilt in the room. B. On being asked, Geeta (PW.16) (deaf and dumb), wife of Kaku Singh deceased communicated by gestures that Darshan Singh, respondent-accused, had stayed with them in the night. He had given a pill with water to Kaku Singh and thus he became unconscious. Two more persons, accomplice of Darshan Singh came from outside and all the three persons inflicted injuries on Kaku Singh with sharp edged weapons. Geeta (PW.16) got scared and ran outside. The motive for committing the offence had been that one Chhindri Bhatni was having illicit relationship with Kaku Singh, deceased, and about 8-10 months prior to the date of incident Kaku Singh caused burn injuries to Geeta (PW.16) at the instigation of Chhindri Bhatni. However, because of the intervention of the community people, Kaku Singh, deceased, severed his relationship with Chhindri Bhatni, who became annoyed and had sent her brother Darshan Singh alongwith other persons who killed Kaku Singh. C. On the basis of the said report FIR No. 262 of 2001 was registered under Sections 449, 302, 201 and 120B Indian Penal Code against the respondent at P.S Hanumangarh and investigation ensued. The respondent was arrested and during interrogation, he made a voluntary disclosure statement on the basis of which the I.O. got recovered a blood stained Kulhari and clothes the respondent was wearing at the time of commission of offence. D. After completion of the investigation, the police filed charge- sheet against the respondent under Sections 302 and 201 Indian Penal Code and the trial commenced. During the course of trial, the prosecution examined as many as 23 witnesses and tendered several documents in evidence. However, Geeta (PW.16) was the sole eye-witness of the occurrence, being deaf and dumb, her statement was recorded in sign language with the help of her father Jaswant Singh (PW.1) as an interpreter. After completion of all the formalities and conclusion of the trial, the trial court placed reliance upon the evidence of Geeta (PW.16) and recovery etc., and convicted the respondent vide judgment and order dated 15.1.2003 and imposed the punishment as mentioned here-in-above. E. Aggrieved, the respondent preferred Criminal Appeal No. 96 of 2003 before the High Court which has been allowed vide impugned judgment and order dated 29.5.2006. 3. Dr. Manish Singhvi, learned Additional Advocate General, appearing for the appellant-State, has submitted that the prosecution case was fully supported by Geeta (PW.16), Jaswant Singh (PW.1) and Buta Singh (PW.15) which stood fully corroborated by the medical evidence. Dr. Rajendra Gupta (PW.17) proved the postmortem report and supported the case of the prosecution. Therefore, the High Court committed an error by reversing the well-reasoned judgment of the trial court. Thus, the appeal deserves to be allowed. 4. Per contra, learned counsel appearing for the respondent has opposed the appeal contending that the deposition of Geeta (PW.16) cannot be relied upon for the reason that she is deaf and dumb and her statement has not been recorded as per the requirement of the provisions of Section 119 of the Evidence Act, 1872. The deposition of Jaswant Singh (PW.1) cannot be relied upon as he was having an eye on the property of Kaku Singh, deceased. The High Court has considered the entire evidence and re-appreciated the same in correct perspective. There are fixed parameters for interfering with the order of acquittal which we do not fit in the facts and circumstances of the case, therefore, the appeal is liable to be dismissed. (i) Incised wound 4½" x 1" bone deep fracture on the right lateral side of face mandible region. (ii) Incised wound 5½" x 2" bone deep all structure of neck cut wound. He opined that the cause of death was injury to vessel of neck, trachea due to injury No. 2 which was sufficient in the ordinary course of nature to cause death. 6. The only question that remains for consideration is whether the respondent could be held responsible for causing the death of Kaku Singh, deceased. Geeta (PW.16) is the star witness of the prosecution. According to her at 6.30 p.m. on the day of incident, respondent-accused came to her house. The accused and her husband consumed liquor together. The respondent-accused had mixed a tablet in the glass of water and the same was taken by her husband Kaku Singh. She served the food to both of them and subsequently, all the three persons slept on cots in the same room. During the night two persons also joined the respondent-accused. It was at 11.30 p.m., accused Darshan Singh had taken out a kulhari from his bag and gave blows on the neck and cheek of her husband. She raised a cry but accused caught her by the hair and asked to keep quiet otherwise she would also be killed. The dead body was taken by the accused alongwith accompanying persons and was put in a room and locked the same from outside. In the court, Geeta (PW.16) witness indicated that she could read and write and she had written telephone number of her father Jaswant Singh (PW.1). It was on her request that Dr. Amarjeet Singh Chawla (PW.4) informed her father. After sometime, Jaswant Singh (PW.1) came there on scooter and saw the place of occurrence. 7. Jaswant Singh (PW.1) deposed that he reached the place of occurrence after receiving the telephone call from Dr. Amarjeet Singh Chawla (PW.4) and after coming to know about the murder of Kaku Singh, he informed Buta Singh (PW.15), brother of deceased Kaku Singh. Jaswant Singh (PW.1) reached the clinic of Dr. Amarjeet Singh Chawla (PW.4), in the way, he met Buta Singh (PW.15) and his son Gurmail Singh. They came to the house of Kaku Singh, deceased and found the blood covered with sand and also the dead body of Kaku Singh lying on a cot in a room covered with quilt. Geeta (PW.16) informed him through gestures that respondent-accused Darshan Singh had killed him with kulhari while Kaku Singh was sleeping. She also told Jaswant Singh (PW.1) about the illicit relationship of Chhindri Bhatni with Kaku Singh, deceased and because of the intervention of community persons, Kaku Singh had severed relationship with Chhindri Bhatni. The latter got annoyed and got Kaku Singh killed through her brother Darshan Singh, respondent-accused. 8. Buta Singh (PW.15), brother of deceased Kaku Singh, narrated the incident as had been stated by Jaswant Singh (PW.1). 9. Dr. Rajendra Gupta, (PW.17), who conducted the postmortem on the said dead body supported the case of the prosecution to the extent that Kaku Singh, deceased, died of homicidal death. 10. Gurtej Singh (PW.2) the recovery witness deposed about the inquest report of the dead body and taking in custody of empty strip of tablet, blood stained soil and simple soil and moulds etc. from the spot. 11. Hari Singh (PW.7), the recovery witness of kulhari (Ext. P- 12) at the instance of respondent-accused Darshan Singh supported the prosecution case to the extent of the said recovery. 12. Ramjilal (PW.23), Investigating Officer, gave full details of lodging an FIR at midnight and explained all steps taken during the investigation, recoveries referred to here-in-above, recording of statements of witnesses under Section 161 Criminal Procedure Code, sending the recovered material for FSL report and arrest of Darshan Singh, respondent-accused etc. 13. Dr. Amarjeet Singh Chawla (PW.4) deposed that Geeta (PW.16) had asked him to give a telephone call to her father and he had accordingly informed her father. After sometime, her father Jaswant Singh (PW.1) had arrived on scooter. In the cross-examination, he explained that Geeta (PW.16) was dumb and deaf, however, could read and write and she had written the telephone number of her father as 55172 and, thus, he could contact her father. 14. The respondent-accused in his examination under Section 313 Criminal Procedure Code, denied all allegations. The trial court found the evidence on record trustworthy and in view thereof, convicted the respondent-accused and sentenced him as referred to hereinabove. (I) There were major contradictions in ocular evidence and medical evidence. As per the statement of Geeta (PW.16), Kaku Singh, deceased and Darshan Singh, respondent-accused had consumed liquor in the evening but this was not corroborated from medical evidence. Dr. Rajendra Gupta (PW.17) has admitted that there was nothing to show that deceased Kaku Singh had consumed liquor. Her version of giving a pill for intoxication of deceased could not be proved by medical evidence. The viscera was sent to Forensic Science Laboratory but the report did not show that any sort of poison had been administered to the deceased. (II) The version of Geeta (PW.16) did not appear to be trustworthy as she deposed that Darshan Singh accused, Kaku Singh deceased and the witness had slept in the same room. It was natural that a husband and wife would not allow a stranger to sleep with them, even if Darshan Singh, accused, was known to them. In view of the fact that relationship between Geeta and Chhindri Bhatni had never been cordial, it could not be believed that Geeta (PW.16) would permit the brother of Chhindri Bhatni to sleep with them. (III) Geeta (PW.16) had admitted in her cross-examination that Chhindri Bhatni had 10 brothers and none of them had ever visited her house. Chhindri Bhatni was living in the same house with deceased and Geeta. She further admitted that she had never seen Darshan Singh, respondent-accused, prior to the date of incident. Even, she could not disclose the features of the accused to the police. In such a fact-situation, the question of sleeping all of them together could not arise. (IV) There could be no motive for Darshan Singh, respondent-accused, to kill Kaku Singh, deceased for the reason that even as per deposition of Geeta (PW.16), Kaku Singh had severed the relationship with Chhindri Bhatni long ago. (V) The name of Darshan Singh, respondent-accused, did not find place in the FIR. The accused persons had been mentioned therein as Chhindri Bhatni and her brother. (VI) So far as the recovery of kulhari (Ext. P-12) is concerned, even if believed, did not lead to any interference for the simple reason that FSL report (Ext. P-64) revealed that there was no human blood found on kulhari. Therefore, the evidence of recovery of kulhari could not be used as incriminating circumstance against the accused. (VII) The evidence on record revealed that Geeta (PW.16) and Jaswant Singh (PW.1) were apprehending that Kaku Singh deceased would alienate his irrigated land to Chhindri Bhatni and, therefore, it became doubtful whether Darshan Singh, respondent/accused could have any motive to kill Kaku Singh, deceased. (VIII) The evidence of Geeta (PW.16) was recorded in sign language with the help of her father Jaswant Singh (PW.1). Admittedly, neither she nor her father while acting as her interpreter had been administered oath. The signs have been recorded alongwith its interpretation. There was possibility of misinterpretation of the signs made by her, as her father could do it purposely, the statement of Geeta (PW.16) did not inspire confidence. (IX) Deposition of Geeta (PW.16) could not be relied upon as it was not safe for the court to embark upon the examination of deaf and dumb witness, on her information without the help of an expert or a person familiar of her mode of conveying ideas to others in day to day life. Further, such a person should not be an interested person. In the instant case, Jaswant Singh (PW.1) had participated in the investigation and was an interested person. 16. We have also gone through the entire evidence and concur with the findings recorded by the High Court. Basic argument which has been advanced by both the parties before us is on the admissibility and credibility of sole eye-witness Geeta (PW.16). Admittedly, Geeta (PW.16) had not been administered oath, nor Jaswant Singh (PW.1), her father who acted as interpreter when her statement was recorded in the court. In view of provisions of Sections 4 and 5 of the Oaths Act, 1969, it is always desirable to administer oath or statement may be recorded on affirmation of the witness. 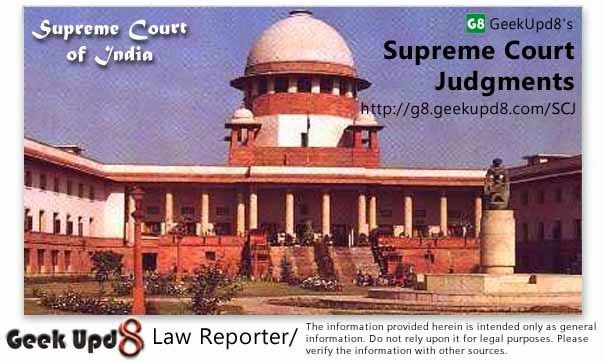 This Court in Rameshwar S/o Kalyan Singh v. The State of Rajasthan, AIR 1952 Supreme Court 54, has categorically held that the main purpose of administering of oath to render persons who give false evidence liable to prosecution and further to bring home to the witness the solemnity of the occasion and to impress upon him the duty of speaking the truth, further such matters only touch credibility and not admissibility. However, in view of the provisions of Section 7 of the Oaths Act, 1969, the omission of administration of oath or affirmation does not invalidate any evidence. 17. In M.P. Sharma & Ors. v. Satish Chandra, District Magistrate, Delhi & Ors., AIR 1954 Supreme Court 300, this Court held that a person can "be a witness" not merely by giving oral evidence but also by producing documents or making intelligible gestures as in the case of a dumb witness (See Section 119 of the Evidence Act) or the like. 18. The object of enacting the provisions of Section 119 of the Evidence Act reveals that deaf and dumb persons were earlier contemplated in law as idiots. However, such a view has subsequently been changed for the reason that modern science revealed that persons affected with such calamities are generally found more intelligent, and to be susceptible to far higher culture than one was once supposed. When a deaf and dumb person is examined in the court, the court has to exercise due caution and take care to ascertain before he is examined that he possesses the requisite amount of intelligence and that he understands the nature of an oath. On being satisfied on this, the witness may be administered oath by appropriate means and that also be with the assistance of an interpreter. However, in case a person can read and write, it is most desirable to adopt that method being more satisfactory than any sign language. The law required that there must be a record of signs and not the interpretation of signs. 19. In Meesala Ramakrishan v. State of A.P., 1994(2) R.C.R. (Criminal) 675 : (1994) 4 SCC 182, this Court has considered the evidentiary value of a dying declaration recorded by means of signs and nods of a person who is not in a position to speak for any reason and held that the same amounts to a verbal statement and, thus, is relevant and admissible. The Court further clarified that 'verbal' statement does not amount to 'oral' statement. In view of the provisions of Section 119 of the Evidence Act, the only requirement is that witness may give his evidence in any manner in which he can make it intelligible, as by writing or by signs and such evidence can be deemed to be oral evidence within the meaning of Section 3 of the Evidence Act. Signs and gestures made by nods or head are admissible and such nods and gestures are not only admissible but possess evidentiary value. 21. To sum up, a deaf and dumb person is a competent witness. If in the opinion of the Court, oath can be administered to him/her, it should be so done. Such a witness, if able to read and write, it is desirable to record his statement giving him questions in writing and seeking answers in writing. In case the witness is not able to read and write, his statement can be recorded in sign language with the aid of interpreter, if found necessary. In case the interpreter is provided, he should be a person of the same surrounding but should not have any interest in the case and he should be administered oath. 22. In the instant case, there is sufficient material on record that Geeta (PW.16) was able to read and write and this fact stood proved in the trial court when she wrote the telephone number of her father. We fail to understand as to why her statement could not be recorded in writing, i.e., she could have been given the questions in writing and an opportunity to reply the same in writing. 23. Be that as it may, her statement had been recorded with the help of her father as an interpreter, who for the reasons given by the High Court, being an interested witness who had assisted during the trial, investigation and was examined without administering oath, made the evidence unreliable. In such a fact-situation, the High Court has rightly given the benefit of doubt and acquitted the respondent. 24. We are fully aware of our limitation to interfere with an order against acquittal. In exceptional cases where there are compelling circumstances and the judgment under appeal is found to be perverse, the appellate court can interfere with the order of acquittal. The appellate court should bear in mind the presumption of innocence of the accused and further that the trial Court's acquittal bolsters the presumption of his innocence. Interference in a routine manner where the other view is possible should be avoided, unless there are good reasons for interference. 25. If we examine the judgment of the High Court in light of the aforesaid legal proposition, we do not find it to be a fit case to interfere with the order of acquittal. The appeal lacks merit and, is accordingly, dismissed.